The Attuvela Mahotsavam Festival is a famous water carnival in the Elankavu Bhagavathy temple, at Kottayam. The festival celebrates in the month of March-April. The Attuvela Mahotsavam is a 2 day long water festival that takes place in the Kottayam city in Kerala. The Goddess Bhagavathy is believed to be a powerful goddess. The parade is having small canoes which are beautifully decorated with exciting colors and music from temple is played. This occasion means as a welcome ceremony to her sister’s land in special way. The Goddess at Elankavu is said to be the sister of Goddess of Kodungallur. Kodungallur Bhagavathy comes to visit her sister goddess Bhagavathy of Elankavu. This water starts from the Attuvela kadavu to the temple. The temple is easily accessible The Attuvela Mahotsavam Festival is celebrated by thousands of people to make the event more beautiful. Attuvela Mahotsavam is one unique water festival. People can joy by watching the beautiful and light parade. 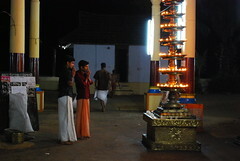 Elankavu Bhagavathy temple is very uniquely and beautifully decorated at the time of this festival. People enjoy this festival; the temple is decorated with lights and colors. Music is also played in the temple.